Collins Booksellers - Innovations in Improving Access to Higher Education by Barbara Schneider & Justina Judy, 9781118872253. Buy this book online. Misperceptions about the college-going process. 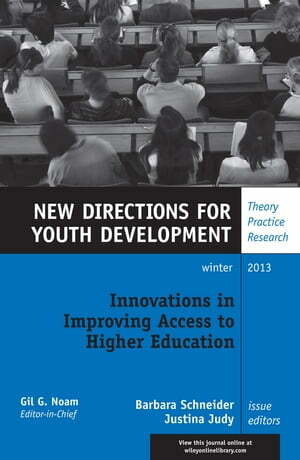 This volume introduces innovative and effective ways to ease the transition process. One essential question examined is the role of high schools and whether they should take a more active role in preparing students for college. While some interventions in this issue are designed for school-wide implementation, others are more targeted and focus on certain aspects of the college process such as financial aid, but all recognize the role of high schools in shaping students’ college-going aspirations and behavior. Highlights how interventions can help to ease these challenges. This is the 140th volume of New Directions for Youth Development, the Jossey-Bass quarterly report series dedicated to bringing together everyone concerned with helping young people, including scholars, practitioners, and people from different disciplines and professions.